This post, is taking both those phrases literally, when I’m reading up on the whole agreement God makes with Abraham. Circumcision being the sign his people belong to God. So, interestingly enough, Abraham had two wives (Sarah and Hagar) and owned slaves! And basically, any of the male individuals that were “under” his house hold, if they weren’t circumcised, they were to be cut off from their people, as they had broken the covenant with God. So after his pow wow with God, Abraham immediately complies, Calls all the males to him. Abraham was 99 years old, and his son (through Sarah’s servant, Hagar) Ishmael was 8 when they circumcised their foreskin. OUCH! I’m thinking there were probably some dudes that were like, “I’m out. How far is it to Egypt? I’ll get my sandals.” The Bible doesn’t reveal if all in the household complied, or if there were any outcasts. And just how the heck did they do it? With what tools? 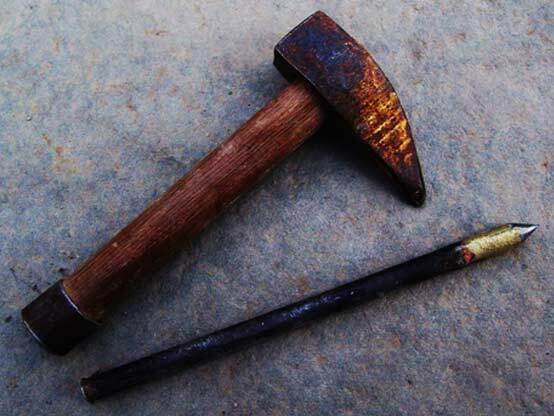 A chisel and a hammer? The way Moses chiseled the 10 commandments onto tablets?